This is a very easily prepared recipe. It's simple, light and delicious and we're sure you'll love it! Remove the leaves and clean the beetroots without removing the skins and boil in salted water for approx. 1 hr or until they are tender. Put in a colander under cold water and remove the skins. Slice the beetroot and arrange on a dish. Beat the yoghurt well in a bowl with the oil, vinegar, garlic and salt. Spread the yoghurt mixture over the beetroot. 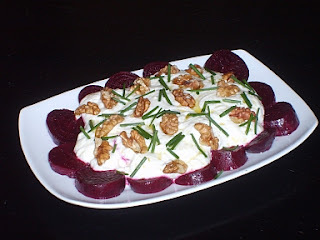 Garnish with the walnuts and chives. Wow.. so yummy to look at. I hope I could also make this one and taste the deliciously taste of it. I will find some time for it.